The shasta daisy thrives in sunny locations in northern gardens but prefers partial shade in southern areas that receive strong afternoon sun. This massive plant reaches a height of 2-½ to 3 feet and produces an abundance of snow-white flowers with bright-yellow centers. When planted in drifts, shasta daisies create depth and dimension in the garden, attracting butterflies and other flying insects. These hardy perennials return each year in larger clumps--except in the Deep South where they are grown as annuals. Propagating by root division in early spring or late fall typically is required every three to five years. 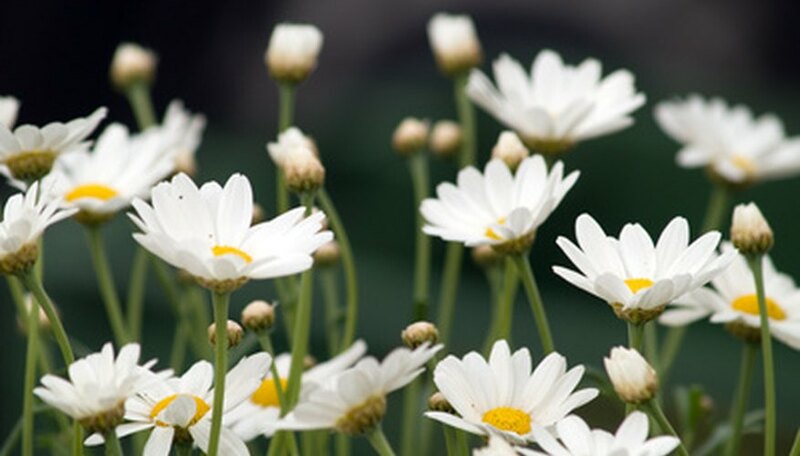 Dig under the root system of the shasta daisy in early spring or late fall with a garden fork or spade. Begin 6 inches from the base of the plant and dig to a depth of 6 to 8 inches. Check that you are not disturbing young roots. Dig all the way around the plant. Slide the garden fork or spade under the roots of the shasta daisy. Lift the entire plant free of the soil. Shake the plant gently to remove excess soil from the roots. Remove them with by hand if the clods of soil remain on the roots Ensure that all the roots are readily visible, and it isn't necessary to remove all of the soil. Pull the plant into several sections by hand. Discard the center of the plant, if it is tough and woody. Check that each section has at least three healthy young shoots and strong roots. Replant the new daisy plants to the original growing depth in a prepared garden bed. Firm the soil over the roots and around the base of the plant to secure it in place. Saturate the soil with water to root level. Keep evenly moist until new growth appears, which typically indicates the roots have become established in the new area. Resume normal care. Water shasta daises deeply once a week.